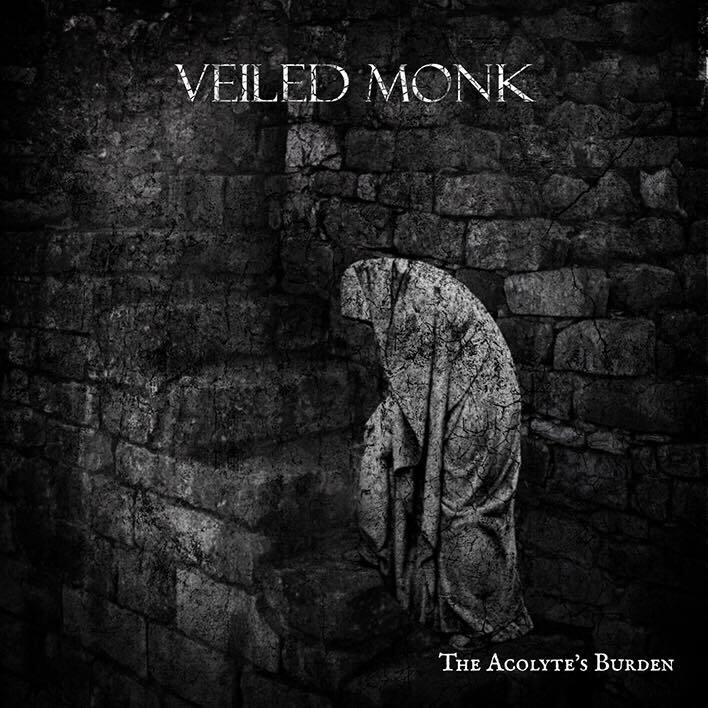 The Acolyte’s Burden is the debut album by Veiled Monk. The music falls somewhere in the realm of dark ambient between ritual and drone ambient styles. While this is his first project as Veiled Monk, the man behind the music has actually been creating music since 2007 under the Melankolia moniker. So the sounds presented on this album are not those of a amateur, the music is crafted with the precision of a master of his trade. The music on The Acolyte’s Burden is quite varied in style. The opening track, “Opening The Night Gate” is an active form of ritual ambient, starting off quietly with a field recording of dripping water. The music slowly begins to build upon itself, adding further field recordings which paint a dark haunting atmosphere. A voice comes into the mix reciting a verse from some dark malevolent religious sect. Drones are present here but they are not the focus of the track. The following track, “Hall of the Wroth God” takes us further down that path of ritual ambient. Drones burst through the silence in a bold manner and continue to rumble througout the track. Over the drones we have a variety of field recordings, some industrial noises others sounding like the whispers and gasps of demoniac entities. In the foreground is a chanting similar to some gregorian chants that we would here on raison d’etre or Metatron Omega albums. The title track, “The Acolyte’s Burden” seems to be using an actual bass guitar to provide the rumbling foundations. Again, throughout the track we hear a plethora of disturbing sounds, seemingly all field recordings captured from some of the darkest and most cryptic places our world has to offer. The track is very subtle and forms a harsh, jarring contrast to the next and final track on the album. “Speak Death, and Enter” could be described as a marriage between the sounds of Desiderii Marginis and Monocube. There are demoniac growls and chants, while simultaneously a horn like drone builds the background, giving it an almost peaceful feel, directly contrasted against the harsh field recorded sounds. I don’t usually like to speak in detail on so many specific tracks of an album, and indeed I’ve covered all but one here. The track by track analysis seemed the best way to convey the vast differences and similarities playing off of one another on the album. The dark, haunting field recordings and demoniac voices are the main connectors across the album. Yet, aside from that, each track has a distinct character of its own. Needless to say, this will not be an album with which anyone should become bored. If you like ritual ambient, in any of its varied forms, be it Shibalba, Metatron Omega or those polar opposite types from the artists on Aural Hypnox label, there will be something here to catch your attention.